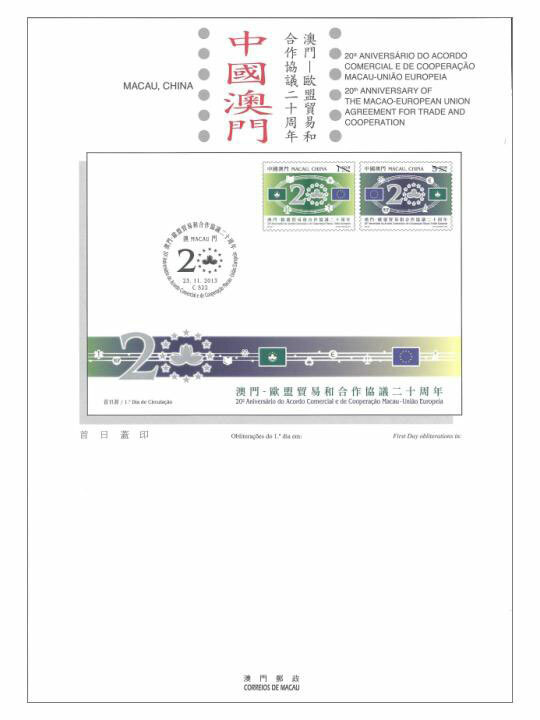 The official relations between Macao and the European Union are structured based on the Trade and Cooperation Agreement entered into force from 1993, upon the celebration of this 20th Anniversary of cooperation between two parties, Macao Post will issue the stamp theme “20th Anniversary of the Macao-European Union Agreement for Trade and Cooperation” on 23rd November, 2013. 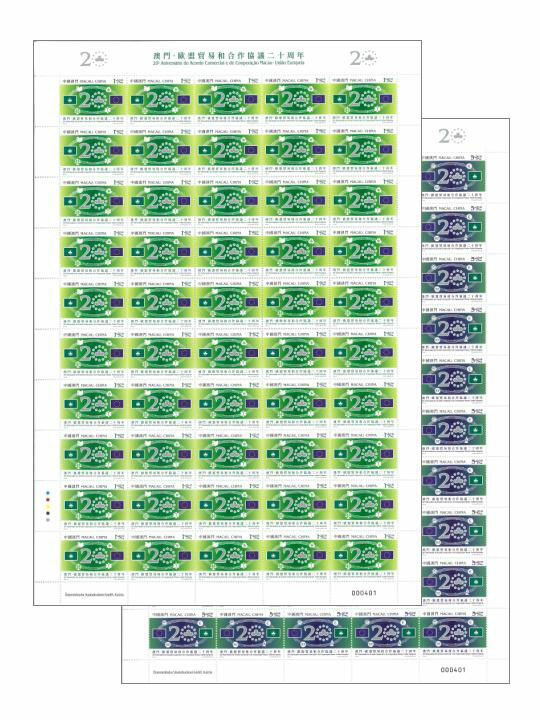 This issue includes a set of two stamps, the stamps illustrating the mutual cooperation of two sides in various fields, including economy and trade, science and technology, academic and professional training, and other areas. The composition of this issue is designed by Macao Post, and the text of the information brochure is written by the President of Institue of European Studies of Macau, Mr. José Luís de Sales Marques. This is the last of the fourteenth issue in 2013. 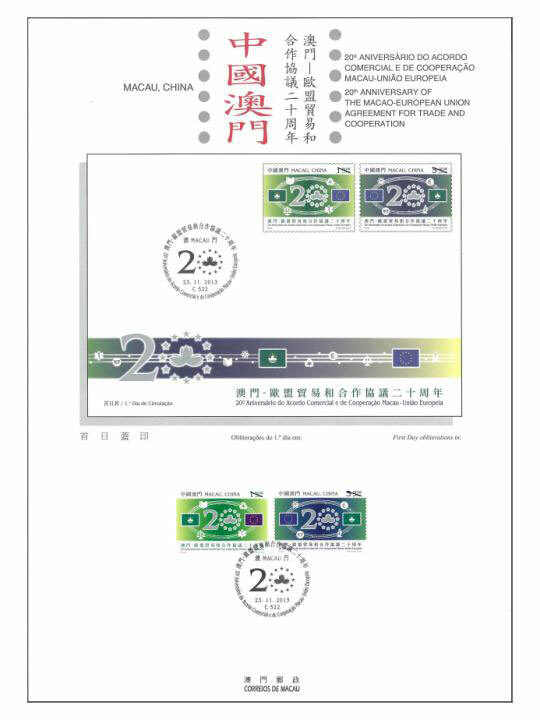 The previous issued stamps are “Lunar Year of the Snake” on 03/01/2013, “Centenary of the Macao Chamber of Commerce” on 23/01/2013, “Mainland Scenery V” on 01/03/2013, “20th Anniversary of the Promulgation of the Basic Law of Macao” on 31/03/2013, “130th Anniversary of the Establishment of the Fire Brigade” on 25/04/2013, the label stamp “Lunar Year of the Snake” on 30/04/2013, “Museums and their Collections III – Macao Museum” on 10/05/2013, “Beliefs and Customs – Na Tcha” on 25/06/2013, “Literature and its Characters – The Romance of the Three Kingdoms II” on 13/09/2013, “Streets of Macao II” on 09/10/2013,“Christmas” on 21/10/2013, “Chinese Calligraphy and Painting – Famous Artists in Macao” on 01/11/2013 and “60th Macao Grand Prix” on 08/11/2013. 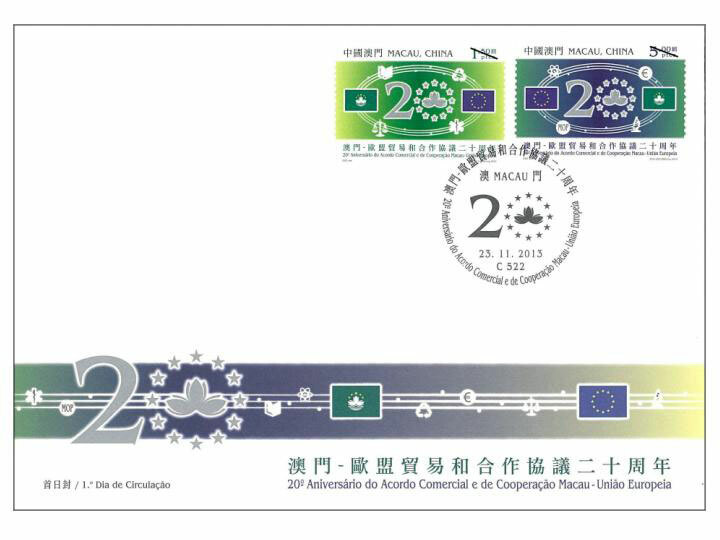 Technical Data of Stamp STAMP ISSUE "20th ANNIVERSARY OF THE MACAO-EUROPEAN UNION AGREEMENT FOR TRADE AND COOPERATION"